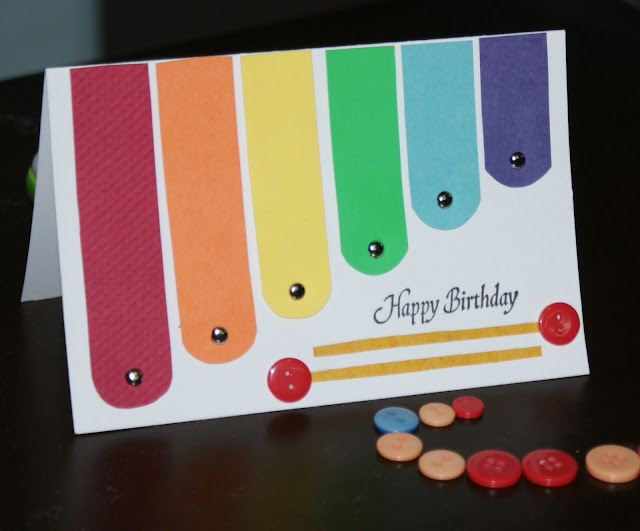 Crafting With Passion: Xylophone Card !! My kids were playing with their stuff in which was a toy xylophone, immediately seeing the colours i wanted to make a card based on it for the current challenge at catchy challenges. I loved how it has turned out. I tried keeping the sticks (or wat ever its called) above the xylophone but i dint want to disturb the clean look, so placed it beneath the sentiment. Nothing else to describe, jus a CAS card. such an amazing concept....love you card.. Cute card Sujana, Thanks for joining us at Catchy Challenges. Awesome card. Love you choice of color. Happy to be your new follower. Do stop by my blog if you like it.